Because we had a member drop out of the free form quilt robin, I volunteered to pick up the slack and work on 2 quilts/month for the remainder of our quilt bee. 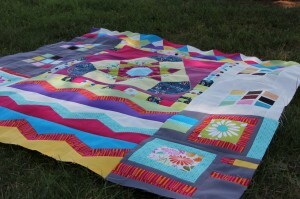 The next quilts I have will be my last! 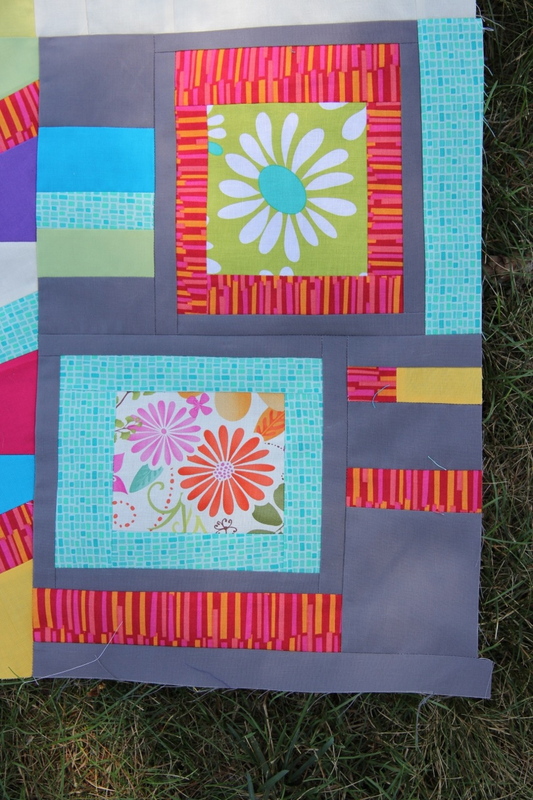 So, this month, I kept Fiona’s quilt, which I added to last month as well. Last month, I added a row of 3-part equilateral triangles to one side of the quilt. 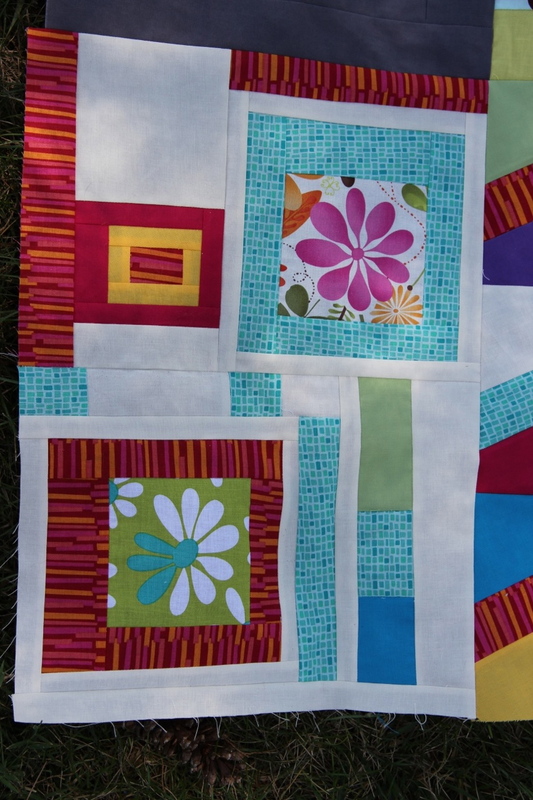 When I went back to this project, I tried to approach it as if I were seeing the quilt for the first time. I wanted to be inspired by the project in its current state. I liked how the triangles I added last month made a secondary chevron or zig zag pattern, so that is the direction I decided to go. Since I used only solids last time, I decided to incorporate some prints this round. When I started working on this quilt, we were still in Bozeman, so I visited a local quilt shop and picked up a couple geometric prints that had the same feel as the pixel print used in the starter piece of the quilt. I surrounded them with the solids I already had and made 3 rows of chevrons. 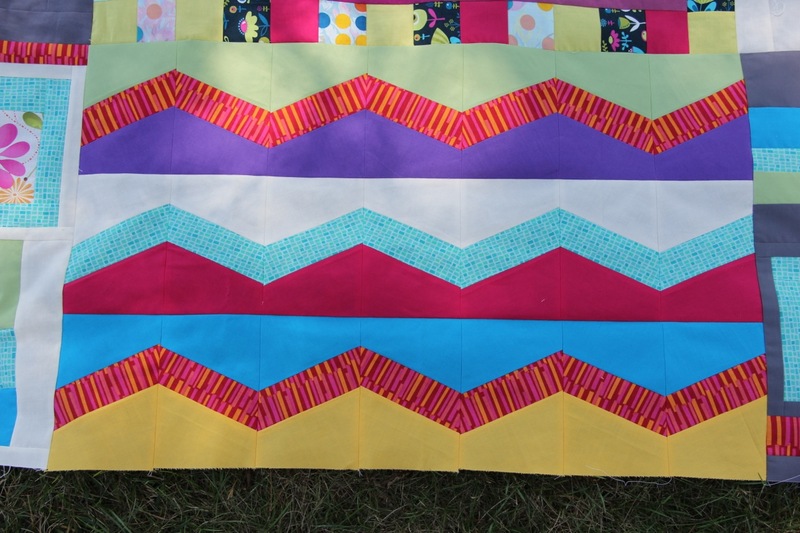 I originally planned to make the zig zag pattern span the length of the quilt, but I ran out of solid. Since the pieces was about as long as the center piece of the quilt, I decided I would add to each end, and use the Kona bone and coal that were already in the quilt as background. I went back to the quilt shop, this time picking a couple of flowers that I thought would work well with the flowers that were in the original piece and one of the additional borders that was added. I ordered the Kona solids and they were waiting for me when I arrived home Thursday. I fussy cut a couple of flowers for each side and started out with them as the center of a log cabin block. From there, I just had fun with some improvisational piecing to fill in the background on each side. Though it wasn’t even in my original plan, I really like how those side portions turned out. I perhaps got a little over-ambitious on this addition, as it’s pretty large relative to the size of the quilt when I started. It is interesting how sometimes a project can go in a direction you didn’t anticipate and still turn out great. I hope Fiona likes it! 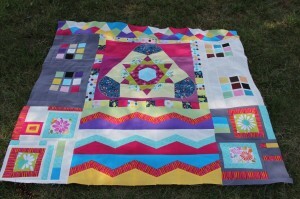 Since I finished this yesterday, I’m going to head over and show it at Sew And Tell Friday with Amy Lou Who. This is kinda neat. Nice placement of blocks and color. WOW! I am so impressed with how all the elements of your quilt come together! Congratulations on such a beautiful quilt!